A laid back resort on Cyprus’ north west coast, Latchi holidays are perfect for couples and families wanting to enjoy a romantic or quiet break in the sun. Often said to be the most romantic resort in Cyprus, Latchi is where Aphrodite is said to have fallen in love with Adonis. It won’t be long until you fall in love with the whitewashed streets and bustling harbour where designer yachts bob against local fishing vessels. Spend your days on the soft golden sand of the beach, taking a dip in the cooling waters of the Mediterranean. Watch the fishermen bring in the catch of the day before sampling some of the freshest seafood and local ingredients served up in fine dining restaurants. Watch the sunset with a glass of wine, exotic cocktail or cool beer, or take to the countryside and try horse riding, cycling or walking through the forests. Latchi is a small town with lots to offer for those wanting to enjoy a luxury holiday. Whether you want to explore the striking emerald forests in the hills surrounding the town or simply find your own slice of paradise on the beach, immerse yourself in the beautiful nature of Latchi. Each of our carefully selected hotels has been chosen to reflect the serenity of the area, with excellent dining options made from local produce, full service spas and opportunities to simply relax. 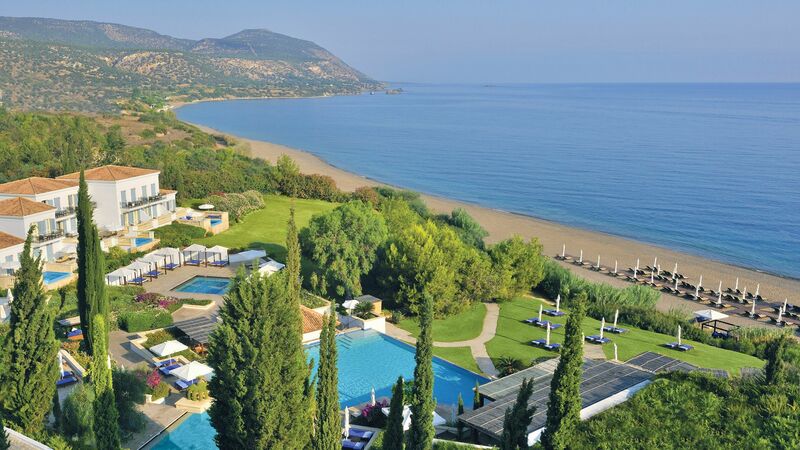 Stay at the Anassa Hotel and relax by one of the swimming pools, walk through the beautiful lawns which lead down to a private stretch of beach or make the most of the hotel’s many facilities. Children can enjoy full days of activities at the Kids’ Clubs while adults head to the spa, before a choice of delicious fine dining options in one of the five bars and restaurants. Water sports, tennis and mountain biking are perfect family activities, while there are plenty of opportunities for couples to relax on a luxury holiday in Latchi. Transfer time from Paphos airport to Latchi is approximately 1 hour.